Set out below are our general grant conditions. In addition, you may have specific grant conditions. If you do, these are included in your accompanying offer letter and you must comply with them. 1 Your grant must be taken up (i.e. started) within one year of the date on which the offer was made, otherwise your grant offer expires. If there is a delay in the take up of your grant, please discuss this with us so that we can consider whether we can extend the timescale within which you may take up your grant. 2 Your grant must only be used for the specific charitable purposes for which it was made, which are stated above. It is restricted for these purposes only. Any changes to your grant, including a variation to the purpose of the grant, must be agreed in writing by us. 3 If the grant is for capital purposes then any claim must be accompanied by relevant invoices. We will also accept pro-forma invoices. 4 The procedures laid down by us for claiming the grant must be adhered to and these are enclosed with the offer letter. Please note that the responsibility for claiming your grant on a regular basis is yours. If during the lifetime of the grant there is a gap exceeding nine months in claiming the next instalment without a satisfactory written explanation we have the right to withdraw the grant. 5 You must comply with our monitoring and evaluation requirements as outlined on the enclosed blue document. 6 You must send us audited accounts, or such accounts as are required by the Charities Act, and an annual report, for the years in which the grant, or any part of it, was received. The accounts should specifically acknowledge the Trust’s grant, the amount you were awarded and that the grant is restricted. 7 Any subsequent application for a grant will only be considered if our monitoring and evaluation and other reporting requirements, in relation to this current grant, have been met. 8 If your organisation issues a news release about the grant or makes any additional announcements relating to the grant, please provide us with a copy. 9 You grant us a non-exclusive, irrecoverable, royalty free license to use and reproduce the materials and or publications produced in whole or in part as a result of the grant for any purpose. You will ensure that all relevant third party permissions have been obtained to enable us to use and reproduce such materials in accordance with this clause. 10 If you did not inform us that you intended to sell or license for value the publications and or materials produced as a result of the grant in your original grant application then you can only do so with our express written permission. If we grant permission for you to sell or license for value such materials or publications, unless you agree with us otherwise, you will pay us a proportion of any net profits equal to the proportion of funding we provided to produce the materials and or publications. 11 If your grant includes salary costs, our funding cannot be released until an appointment to the funded post has been made and you have informed us that this has happened. You will need to tell us where the post was advertised, who was appointed, the number of hours they will be working, and their start date. 12 We expect you to advertise all posts funded by us. If this is not possible, please contact your Grants Manager. 13 If your grant is towards an existing post, which is not vacant, please tell us the name of the current post holder, when they were appointed and the date from which the Trust’s grant will be used to fund the post. 14 If the post we are funding becomes vacant at any point (for example, because the individual has left your organisation, is on long-term sick leave, or on maternity leave, etc.) you need to inform us immediately. You will need to tell us what arrangements you are making to cover the post and if applicable your timetable for recruitment. If you are not using temporary cover you will need to stop claiming your quarterly requests for payment until the post is no longer vacant. 15 We expect you to comply with all relevant employment legislation and provide appropriate staff/volunteer supervision and support. 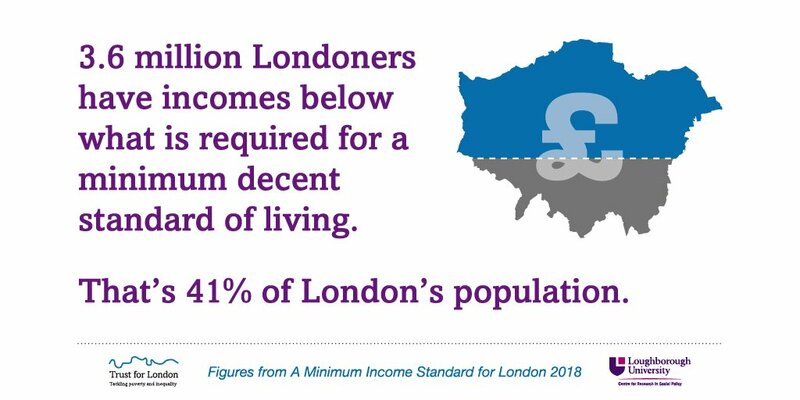 16 We will not fund posts which are paid below the current London Living Wage and we would encourage you to become a Living Wage Employer. Details of this can be found at: www.livingwage.org.uk. If you need help with this please contact us. 17 We will not pay redundancy for any employee whose employment is terminated because funding has run out. 18 We expect you to work within an equal opportunities framework in relation to your staff, volunteers, trustees and beneficiaries. 19 If you require match funding to deliver the work for which we have awarded a grant, you must secure this and inform us before you can claim our grant. If this is proving difficult within our one-year timescale of claiming the grant, please discuss this with us. 20 If, during the process of making this application, or while this grant is current, your organisation is successful in securing funds for the same or related purpose either in whole or in part from another funder, we must be informed immediately. 21 Please inform us of any major changes to your organisation, this may include impending mergers, financial difficulties, significant loss of funding, significant changes in staffing, and/or Charity Commission matters. 22 If you change your address, please inform us, providing details of your new address on your organisation’s headed notepaper. 23 If you need to change the names of signatories who are authorised to claim your grant, you will need to write to us providing details of the changes and a specimen signatory for the new person. The letter needs to be signed by one of the current signatories. If this is not possible, i.e. if both signatories have left, please let us know and we will supply you with a ‘change of signatory form’, which will need to be signed by your Chair, Secretary or Treasurer, with your organisation’s Board minutes verifying their position. 24 It is a condition of grant aid that the organisation complies with Health and Safety legislation. If, following a monitoring or any other visit we are concerned about any aspect of health and safety, the grant shall be suspended until such time as the premises have been inspected and passed safe. Such an inspection shall be carried out by an independent consultant appointed by the Trust or by an officer of the relevant statutory authority. Any concerns about health and safety should be discussed with us at as early a stage as possible. We reserve the right to withdraw, reduce, vary or withhold the grant, in whole or in part in the event of: any failure to comply with the above (and any other specific conditions outlined in your offer letter); and where the law is not being complied with.